Hiawatha High Schoolers were instructed on how to be ‘The Happiest Person on the Planet’ on January 9th. 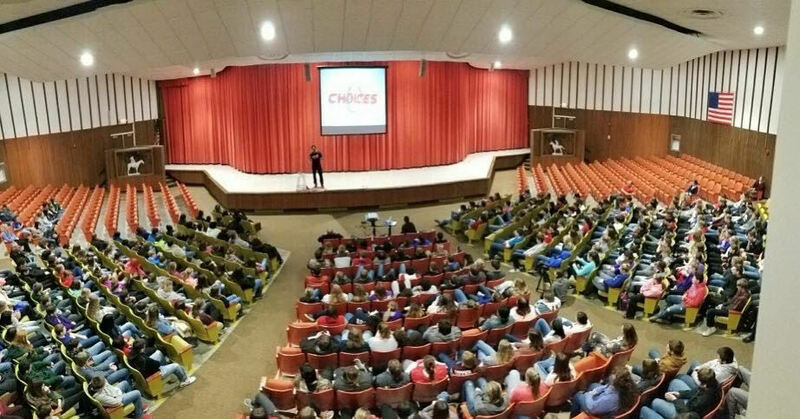 Motivational speaker, professional wrestler and author Marc Mero traveled to the high school to speak on the way choices affect the lives of the choice maker and those around them. Mero began his presentation by describing his life growing up and how it enabled him to establish his dreams and goals. He then told of the setbacks he encountered along his journey through life and how he overcame these setbacks. The journey began with a 10-year-old Mero listening to his mother, who held two jobs to try and support her family, cry herself to sleep every night. One night, when Mero could stand the crying no longer, he went to his old, broken desk and wrote yet another one of his dreams in a little brown book. “I want to buy my mom a house,” the young Mero wrote on that night. He explained that he kept that little book of dreams open where he would see it everyday as he grew up. Once Mero got older, he discovered his talent in boxing. He was waiting and training for his first match, in his hometown, when he got in an accident and shattered his nose. His doctor had told him that it would take a year before he could get back to full contact boxing. Mero’s mother was very supportive of his career, but Mero began hanging out with the wrong crowd. Soon he found himself addicted to drugs, drinking all the time, and he working as a construction worker digging dirt for pools to be installed. He would never play catch with his little brother, never talk to his mom, and he never wanted to sit by his little sister. One day, when sitting around with his friends, Mero got a huge wake up call when he saw professional wrestling on the T.V.. By that time, Mero was about 30 years old, but that didn’t stop him from making his way to the pros. Once he made it, he bought his mom a house, and himself a house, speed boat, and black Cadillac. In doing all of that, he had accomplished four of his dreams and goals from his little brown book. Mero always expected happiness to come with money, and when it didn’t, he bought himself a bigger house and got back into the drug scene. One day, Mero got the news that his sister had lost her six month battle with cancer. That, along with looking at the “death list” of friends , most of whom had died from overdoses and poor life decisions, caused Mero to get away from drugs for good. When Mero was on tour in Japan, he received the news that his mother had passed away, and about two weeks later his little brother had a fall when getting a drug test for a job. His brother was pronounced brain dead soon after Mero arrived to the hospital, and the family had to make the decision to let him go. A month later , his deceased younger brother’s daughter was born. Mero decided that he couldn’t sit by and let young people make bad decisions that led to unimaginable consequences if he could help it . He founded the non-profit Champion of Choices, an organization where Mero visits schools, churches, and other venues to inform young people of his story and to show them that their actions all have consequences, and to make the best decisions that they can. After completing all of his goals, he set a new goal for himself; he told himself that he would write a book by the end of 2010. Not only did he tell himself that, but he wrote “Book by 2010” on a sticky note and put the note on his computer to see everyday. By the end of the two year time frame, Mero had written a book. He now encourages students to write their dreams down where they would see them everyday. There were tears, laughs, and smiles throughout the emotional rollercoaster of a presentation. Mero had not only informed the students of HHS, but he also encouraged them through his own life story. Many students walked away reminded of the value of their personal goals. Hiawatha High Schoolers can now all go from believers to achievers of their own dreams and destinies.